The Wellness Center racquetball court is available for members and guest pass guests. The court can be reserved on a first-come, first-served basis for up to an hour at a time. For racquetball reservations, please contact the front desk at 738-3995. 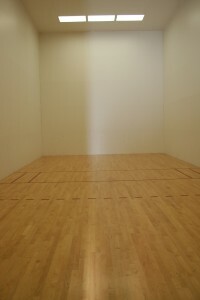 The racquetball court is available for racquetball or Wallyball. Wallyball net can be set up if requested in advance. All players must check in at the front desk before going to the court. Players are required to wear protective eyewear. Wrist straps must be worn on all racquetball racquets. Racquetball equipment is available at the front desk for your use if you prefer.